Georgina Medina, owner of Zurban Wear. Bright colors and bold statements from a bright and bold woman. Tulalip tribal member Georgina Medina recently opened Zurban Wear, a hip, urban clothing retail store in north Marysville. Boasting a laid-back vibe with racks of layer-friendly tanks, billowing tunics, trendsetting leggings, and bold t-shirts, fashion forward men and women have a new alternative to the mall, that offers prices competitive with the outlet stores. Having an interest in fashion since she was young, opening a trendy clothing store was a natural choice for Medina. And opening a retail business is no easy feat. It takes persistence and skill. Seeking out the latest fashions and working with suppliers to build stock, finding a location, setting up shop and spreading the word are just some of the obstacles Medina has tackled. Urban Wear features trend setting fashions by Filthy Dripped, Diamond, DFYNT and more. 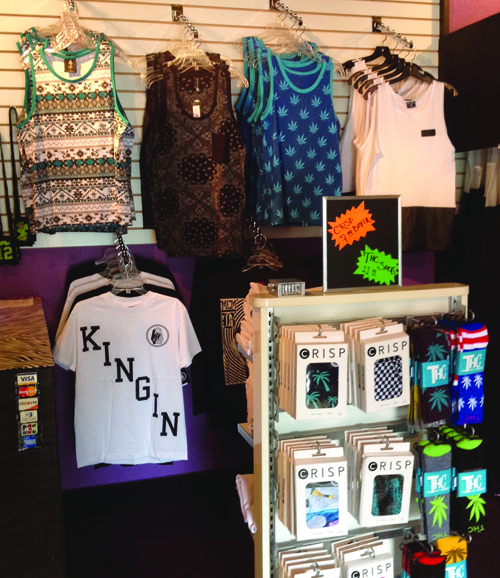 With brands like Filthy Dripped, Diamond and more, offering cutting-edge clothing and accessories for men and women, Zurban Wear is an ideal place to shop for younger crowds and great for back to school gear. And this is not just a story of a small business owner; it’s a story of the strength and determination of overcoming addiction. If you’re itching to add some more flair to your look, check out this affordable boutique for trendy, stylish pieces that won’t break your budget. Zurban Wear is located at 9920 State Ave, Suite I, Marysville WA 98270. (Behind La Hacienda restaurant, across from Fred Myers.) Also like Zurban Wear on Facebook @ Zurban Wear. This entry was posted in Arts & Entertainment, Local News, Tulalip News and tagged fashion, MARYSVILLE, Tulalip, urban clothing, Urban Wear by Kim Kalliber. Bookmark the permalink.